Gary Stevens, the Hall of Fame jockey, is expected to announce his retirement Friday morning, according to several of the rider's friends and business associates. Neither Stevens nor his publicity agent would confirm or deny the retirement, but a press conference has been scheduled for Friday at Churchill Downs. His final ride most likely will come aboard Stream Cat in the Kentucky Jockey Club Stakes on Saturday at Churchill. This would be the second time that Stevens, 42, has announced his retirement. The first came in abrupt fashion at Santa Anita on Dec. 26, 1999, when he cited chronic pain in a knee that had undergone surgery four times. During that retirement, which lasted about 10 months, he worked as a jockey agent and assistant trainer. Stevens put his career on a lengthy hold in 2002-03 when he accepted a key acting role in the movie "Seabiscuit," in which he gained acclaim for his role as jockey George Woolf. "Seabiscuit" was released in July 2003. Stevens has won virtually every major race in North America, including three runnings of the Kentucky Derby and eight Breeders' Cup races. Through Tuesday, he had ridden 5,005 winners worldwide, and his mounts have earned more than $221 million in North America. Stevens and his wife, Angie, sold their house in Sierra Madre, Calif., and moved to Louisville last summer, several months after he began riding regularly in Kentucky. At the time, he said he planned to form a year-round riding circuit revolving around the spring and fall meets at Keeneland and Churchill. He has ridden mostly in higher-class races, which has limited his number of mounts. Since moving to Kentucky, he has ridden primarily for Patrick Biancone, who trains many well-bred and expensive young horses for such deep-pocketed clients as Michael Tabor, for whom Stevens rode 1995 Kentucky Derby winner Thunder Gulch, and John Magnier. Biancone is the trainer of Stream Cat. "What can you say about one of the best?" said Biancone. "Gary is a great jockey. I regret that he doesn't keep riding longer. He is a lovely man to work with. He is so concentrated on his job. He tries to find everything he can do to help, to analyze your horse." Among the best horses that Stevens rode were Thunder Gulch, Point Given, Silver Charm, Winning Colors, Victory Gallop, and Rock Hard Ten. Stevens was inducted into the Hall of Fame in 1997 at age 34, becoming the fourth youngest to win that honor. He won the Eclipse Award as top jockey once, in 1998, when he posted a career-high $16.7 million in mount earnings. His many career honors include earnings titles in 1990 and 1998, and the George Woolf Award in 1996. This year, Stevens has won 94 races, including four Grade 1 events, from 484 starters, with his mounts earning more than $9.2 million. Stevens is the son of trainer Ron Stevens and the younger brother of jockey Scott Stevens. He was born on March 6, 1963, in Caldwell, Idaho, and at age 7 he was he was found to have Perthes syndrome, a degenerative disease of the hip joint that forced him to wear a metal brace on his leg for 19 months. Undaunted, the young Stevens began grooming horses for his father at age 8 and began his riding career on Quarter Horses at age 14. He dropped out of school at age 16 to become a jockey, winning his first Thoroughbred race at Les Bois Park in 1979, then quickly progressed from the small tracks of Idaho to become a top jockey at Longacres in Washington. Several years later, he made a swift transition to stardom on the Southern California circuit, where he lived and worked for some 20 years before moving to Kentucky. He may have made his name out west but is a familiar face on the Triple Crown circuit. His victories in the Kentucky Derby began in 1988 aboard Winning Colors which he credits as his most exciting win, This was followed with victories by Thunder Gulch in 1995, and Silver Charm in 1997. In 1995, Gary won the first and last legs of the series with Thunder Gulch, trained by D. Wayne Lukas. Thunder Gulch finished third in the Preakness. In 1998 Real Quiet won the Derby and the Preakness and looked to have the Crown wrapped up when Kent Desormeaux had him in front by five lengths in the stretch of the Belmont Stakes. And then along came Gary. In one of the greatest rides in history, Stevens and Victory Gallop caught Real Quiet by a nose to win the mile-and-a-half Test of the Champion. Gary retired in December of 1999 with debilitating knee pain , but not before he had ridden a colt named Anees to win the Breeders' Cup Juvenile the month before. Knee problems have plagued him. He underwent surgery Dec. 1, 1999 to have a cyst removed from his right knee; returned Dec. 26 of that year but announced his retirement that day, citing chronic pain and wear-and-tear on his knees. Prior to that knee surgery were operations in 1995, 1997 and 1998. Following retirement, he became an assistant trainer for trainer Alex Hassinger and the Thoroughbred Corp. but not riding was difficult for him. He resumed riding Oct. 4, 2000. He was back in the Triple Crown limelight just a few months later with Derby favorite Point Given, son of Thunder Gulch. After suicidal early fractions, on a phony-fast racetrack, the Bob Baffert-trainee finished fifth to Monarchos. But it was Point Given, Baffert, Thoroughbred Corp. and Stevens who reigned supreme at Pimlico and Belmont Park, winning the Preakness, the Belmont. Gary feels that Point Given deserved the Triple Crown that year and that Kentucky Derby is perhaps the loss he regrets the most. First winner: May 16, 1979, at Les Bois Park on Lil Star (first career mount). Plus: Two Preakness Stakes, 3 Belmont Stakes; 8 Breeders' Cup races; 4 Santa Anita Handicaps; 1 Dubai World Cup, and 1 Japan Cup. Family: Wife, Angela Athayde; daughters Ashley and Carlie, sons T.C. and Riley. Top honors and accomplishments: Inducted into the National Museum of Racing and Hall of Fame in 1997; voted Eclipse Award as top jockey in 1998; voted George Woolf Memorial Award in 1996; former president of The Jockeys' Guild; youngest jockey to surpass $100 million in mount earnings, 1993; won 15 meet titles on Southern California circuit; led North American jockeys in earnings in 1990 and 1998. Other notable: Played jockey George Woolf in the 2003 box-office hit, "Seabiscuit." 10/30/05 - Gary gets his 5,000th WIN aboard the filly JOINT ASPIRATION in the 7th at BELMONT. He is the 20th jockey to achieve this goal! Inducted into racing's Hall of Fame in 1997. Won the Eclipse Award as the nation's top jockey in 1998. Eight Breeders' Cup races including two in 1998 when Silverbulletday took the Juvenile Fillies, and Escena took the Distaff. Won the 1991 Japan Cup with Golden Pheasant. Won the riding title at the York meeting in England for trainer Michael Stoute in 1999. Has won eight Breeders' Cup races from 86 mounts: the 2000 Mile with War Chant, 1999 Juvenile with Anees and the 1998 Distaff on Escena and Juvenile Fillies on Silverbulletday, 1996 Mile on Da Hoss, 1994 Distaff on One Dreamer, 1993 Juvenile on Brocco and 1990 Turf on In the Wings (GB). Inducted into the Racing Hall of Fame in 1997. Received Eclipse Award as North America's outstanding jockey in 1998. Top victories in his surgery-interrupted 2002 season have included: Del Mar Debutante Stakes (Miss Houdini), Santa Maria Handicap (Favorite Funtime), Massachusetts Handicap (Macho Uno), Peter Pan Stakes (Sunday Break [JPN]), La Canada Stakes (Summer Colony), San Marcos Stakes (Irish Prize) and Santa Ynez Stakes (Dancing [GB]). Has won eight Triple Crown races: three Kentucky Derbies — Winning Colors (1988), Thunder Gulch (1995), Silver Charm (1997); two Preakness Stakes — Silver Charm (1997), Point Given (1998); three Belmont Stakes — Thunder Gulch (1994), Victory Gallop (1998, Point Given (2001). Other $1 million or greater race victories exclusive of Breeders' Cup and Triple Crown victories include the $2 million Dubai Golden Shaheen (Caller One, 2002), the Godolphin Mile (Grey Memo, 2002), Arlington Million (Golden Pheasant, 1990, and Marlin, 1997); Canadian International (Singspiel, 1996, and Royal Anthem, 1998); Dubai World Cup (Silver Charm, 1998), Haskell Invitational Handicap (Point Given, 2001); Hollywood Gold Cup (Gentlemen, 1997), Santa Anita Handicap (Ruhlmann, 1990; Farma Way, 1991; Urgent Request, 1995). Earned national money titles in 1990 and 1998 ... Ranked among top 10 money winners from 1985-99 and in 2001. 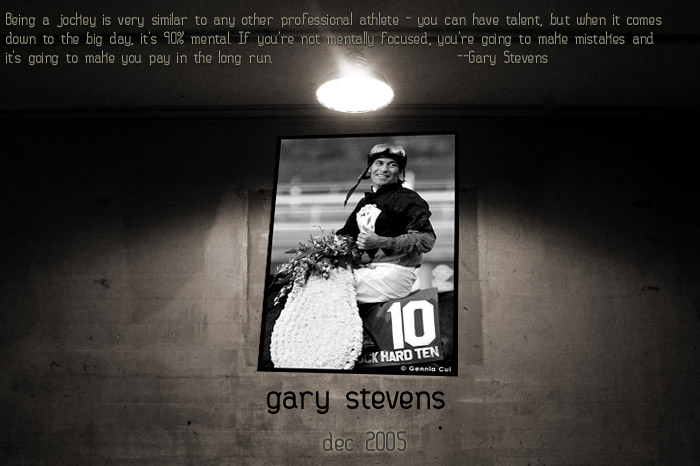 Visit Gary Stevens official website!